“High energy movement meditation to liberate your creative dance force. Yoga Trance Dance is a meeting of two great rivers, yoga and dance, which come from and are untied at the source. The infinite creative source is the One, uniting us all. 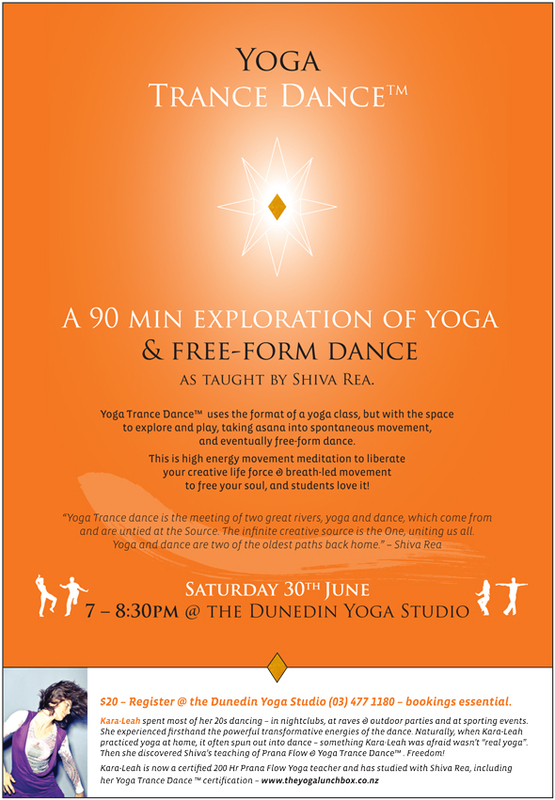 Yoga and dance are two of the oldest paths back home.”Shiva Rea, teacher of Yoga Trance Dance™ & Prana Flow Yoga. Yup – it’s ok to dance and practice yoga all at the same time! Yoga and dance are one and the same – breath-led movement designed to free our souls. Yoga Trance Dance™ follows the format of a yoga class, but with the space to explore and play, taking asana into spontaneous movement, and eventually free-form dance. 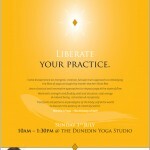 Register at The Dunedin Yoga Studio (03) 477 1180. Bookings essential.